These replacement solid lids are suitable for use with both the 15ltr and 25ltr fermenting bins from Youngs. They can not be used with buckets from Ritchies or Hambleton Bard. 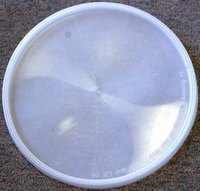 They are approximately 31.5cm diameter and can easily be drilled with either a 13mm hole and then fitted with a grommet for use with an airlock, or a 25mm hole and used with a standard cork or rubber bung, if fitting an airlock, or to allow a thermostatic heater to be placed through and into the wort. If you are planning to fit a heater through the drilled hole, you need to be aware that the 25mm hole need to fit the bung correctly will be a VERY tight fit when trying to pull the jeater through it. DO NOT be tempted to drill a bigger hole to make it easier to insert the heater as a bigger hole will not be tight enough to hold the bung in place.